Yes, another post about Drawdown – but this time about the fundamental mindset Paul Hawken brings to the challenge. Here’s someone who’s been working on solutions for 40 years – and who is still constructive, positive, engaging and inspiring. There’s a deep mindset shift going on – one that Paul Hawken has been clarifying for me ever since I read Natural Capitalism back in 2002. It’s become even more clear since I found the inspiring words at the end of his University of Queensland presentation. I’m not going to meddle with 40 years of communications skill – just condense the phrasing for readability. I’ve added time stamps so you can listen to the original and check my interpretation. 27:02 (Marine Permaculture) Recycled PET frames with tubes going down to the thermocline… activated by the rise and fall of the sea and ocean … 93% of the heat of global warming is going into the oceans and producing heat “blankets”… that interrupt circulation patterns. … this restarts them. 28:40 What it does is cools the water and de-acidifies it. It can be used to reverse coral bleaching if done in a significant way. 40:00 (Diversity is crucial) Diversity is innate in this planet…..
40:33 If we’re going to do this. If we’re going to come together we have to change the way we’re talking to each other, we have to change the language. This is the language we’re using “fight” “combat”, you know… Gosh “climate crusade” – that is a really unfortunate term. Hasn’t anybody read history?!?! “Decarbonisation” – that’s not a solution, it’s a description of the problem… We decarbonised the earth with our agricultural methods and our combustion of fossil fuels. That is NOT the solution. “Recarbonisation” is the name of the solution. 42:00 The most important thing about this language is that basically we’re objectifying the climate. First of all, you can’t ‘fight’ climate change. You can think it, but what are you going to DO…. The climate changes every nanosecond, it’s supposed to change, it’s a blessing, it’s fantastic, thank god it changes. Fight it? Really?! 42:30 What is the intention when you say fight, combat, battle? The problem with that is that you’re making it “other”, you’re objectifying life, you’re objectifying this extraordinary, miraculous place we call Earth and saying part of it is “the problem”. No it’s not, we’re the problem. It’s fine. 42:50 And that objectification is the disease, the disease of this world today. We objectify women… . We objectify religions… we objectify everyone we think is less than us. That is a disease. That is NOT going to be the mental state that solves the problem. To think about the atmosphere or the climate as ‘other’. 43:30 Climate change, as it is called, global warming,… is a blessing, it’s a gift. It’s not a curse. Why? Because it’s a system. This earth is an extraordinary system. Who knows if we’ll ever understand even 10% of it – it’s so amazing. … It’s just extraordinary, you know. 44:15 Any system that denies feedback and basically ignores it perishes – absolutely. And so this is feedback and it’s feedback to inspire us to reimagine what it means to be a human being…. at this point in time in civilization. And to reimagine what it means to be an architect, an engineer, a student, a farmer, a forester, a wife, a child. To be all the things that we are. It means, can we look at it in an entirely new way? And when you name the goal to REVERSE global warming. It doesn’t make it more difficult, it makes it easier. 45:10 When you think this is happening TO you, like it’s a curse, ‘Oh my god’, you know, ‘how unlucky I was to be born now, I didn’t do this, I’m not responsible’ When you think of yourself as a victim, as an object, you are disempowered. …when you think about this as something that is happening FOR us …then you take 100% responsibility. You stop blaming people, you honour the science. The IPCC has 2.5 billion data points behind the last assessment – the fifth assessment. It is the most astounding problem statement that humanity has ever created…Extraordinary! 45:50 But you don’t solve a problem by repeating the problem over and over again to each other. You solve a problem by looking at the possibilities that are inherent in that problem. That’s what Drawdown is about. The solution to global warming is to shift our whole global economy from its inherent Industrial Revolution “extract/emit” assumptions to smarter, more productive “upcycle/regenerate” design thinking. 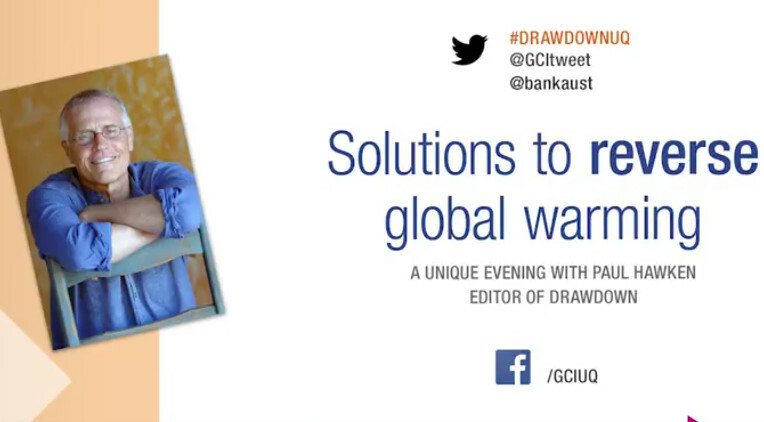 Drawdown describes the scale and scope of the shift required – the shift to an economy that consumes greenhouse gases and regenerates the ecosystems that stabilise our climate. 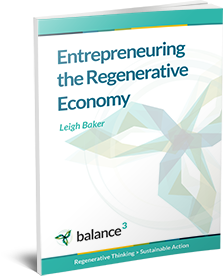 The “how” is a whole creative, opportunity-filled set of solutions based around the design principles from 40 years of research and development – principles such as The Circular Economy, Systemic Design and Biomimicry. Economic invention and innovation doesn’t come from “consumers” and it doesn’t come from “government” and it doesn’t come from “industry”. It comes from humans at all levels – and it can be inspired by the right communication. While future existential threat doesn’t change human behaviour, achievement and future opportunity drives us forward. So does the challenge of big problems – when we understand where the solutions lie. So if we put Drawdown’s ultimate challenge – realising some of those savings of $74 trillion in costs avoided – in front of engineers, innovators and entrepreneurial thinkers, we have a much better chance of accelerating the shift to Living Business – or whatever we end up calling our new economy. Here’s the video, so you can listen first hand – and while the image resolution is a bit ordinary, the content is awesome.